I’ve admitted before that I have an absolute obsession and addiction to hamburgers of all kinds, it’s my definite go to. BUT as I age, I, unfortunately, need to start watching my carb intake… wha wha! With that said, here is my recent discovery, ta-da with jazz hands! Introducing the Bacon Cheese Burger Salad. You can follow the recipe below or get creative, there are a gazillion burger combinations. Enjoy! 1 teaspoon yellow mustard – sadly my son “hates” mustard, I would omit this ingredient if he were here. Dressing Directions – combine all ingredients stirring until smooth. Keep refrigerated until ready to use. Salad Directions – cook ground meat over med-high heat until done, seasoning with salt and pepper to your liking. Let cool so it not too hot to wilt the lettuce. 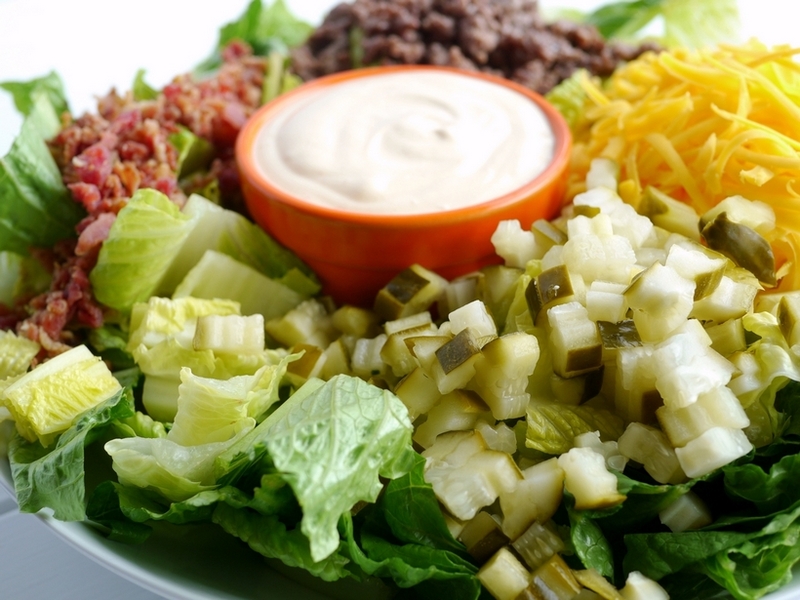 In a large bowl combine lettuce, cheese, dill pickle, bacon and ground beef. Toss with dressing or serve individually with dressing on the side. *Note: Branden my son and I are pickle snobs – not just any pickle will do, especially when it’s a key component to this salad. Go for something garlicky or spicy. Here are a couple brands I like: McClure’s, Suckerpunch and Bubbies. I plan to can my own pickles this year with my friend Kim – I’ll be sure to let you know how that adventure goes.